This article is about Falls Road in Belfast, Northern Ireland. For other uses, see Falls Road (disambiguation). The Falls Road (from Irish túath na bhFál, meaning 'territory of the enclosures') is the main road through west Belfast, Northern Ireland, running from Divis Street in Belfast city centre to Andersonstown in the suburbs. Its name is synonymous with the republican community in the city, whilst the neighbouring Shankill Road is predominantly loyalist, separated from the Falls Road by peace lines. The road is usually referred to as the Falls Road, rather than as Falls Road. It is known as the Faas Raa in Ulster-Scots. The Falls Road derives its name from the Irish túath na bhFál, an Irish petty kingdom whose name means "territory of the enclosures". This territory was roughly the same as that of the ecclesiastical parish of the Shankill, which spanned a large portion of modern-day Belfast. 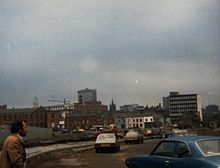 By the 1960s the buildings in the area had decayed considerably and the Belfast Corporation introduced a major development plan which involved wholescale demolition of much of the area. In the Divis Street area, the housing was replaced with the Divis Flats complex which consisted of twelve blocks of flats built on top of the historic district formerly known as the Pound Loney. The high point of this redevelopment was Divis Tower. Because of its rapid deterioration, the whole complex, except for Divis Tower, was demolished thirty years later and replaced with blocks of terraced housing. 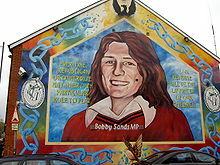 A predominantly working class community, the Falls Road has historically had a strong socialist tradition, and, prior to the 1970s, had been less Irish nationalist than other areas of Northern Ireland. James Connolly resided in the Upper Falls for a period in the early 20th century and was involved in organising the workers but the area was generally seen as a bedrock of the Irish Parliamentary Party (IPP) at the time. Éamon de Valera standing for Sinn Féin lost heavily standing in the Falls constituency in the 1918 UK General Election to the IPP's Joe Devlin. Connolly's secretary Winifred Carney also lived on the Falls with her husband, George McBride, a Protestant and World War I veteran. The past century has seen an ongoing contest between various versions of labour/socialist and nationalist/Irish republican for electoral leadership in the area. In the 1929 election to the new Parliament of Northern Ireland, the Belfast, Falls constituency was won by the Nationalist Richard Byrne after a bitter contest with William McMullen, a supporter of Connolly. In the 1945 election, Harry Diamond won the seat standing for the Socialist Republican Party. He held the seat until 1969, when he was defeated by Paddy Devlin standing for the Northern Ireland Labour Party. Devlin, who had once been a member, alongside Diamond, of the Belfast branch of the Irish Labour Party, became a founding member of the Social Democratic and Labour Party in 1970 and remained a member until Parliament was prorogued in 1972. In 1964, Billy McMillen stood as a Republican Clubs candidate for the Belfast West constituency in the Westminster election. His office was in Divis Street and the Irish tricolour alongside the Starry Plough of Connolly's Irish Citizen Army was displayed in the window. The Flags and Emblems Act gave the Royal Ulster Constabulary the power to remove any flag or emblem from public or private property which was considered to be likely to cause a breach of the peace. This was generally interpreted as any Irish flag since the Union Jack was specifically excluded from the Act. Ian Paisley insisted the Royal Ulster Constabulary remove the Irish tricolour or he would organise a march and remove it himself. The police feared a backlash from Loyalists, and removed it, causing unrest and rioting by local residents. In the late 1960s, many Catholics from across Northern Ireland began to campaign, many with Northern Ireland Civil Rights Association (NICRA), against discrimination in housing and jobs, under the banner of a civil rights campaign, in conscious imitation of the philosophy of, and tactics used by, the American Civil Rights Movement. Many Unionists saw NICRA as an Irish republican Trojan horse, designed to destabilize Northern Ireland, and force unionists into a united Ireland. Several streets around the Falls Road were burnt out by loyalists in August 1969. In response to the worsening situation, the British Government deployed the British Army on the Falls Road. The troops were initially welcomed by many but not all Falls residents to protect them, but heavy handed tactics by the mostly mainland British-born members of the Army who did not know, care or understand the situation would estrange most Catholics and nationalists. In 1970, the road was the scene of what became known as the Falls Curfew. 3,000 British troops sealed off the streets around the Falls road, home to about 10,000 people, setting off CS gas. The British actions were opposed by the Official IRA (OIRA), who engaged them in a vicious gun battle. Over the course of the weekend, four Catholic civilians were killed by the British Army. Ninety rifles were recovered. This is widely regarded as the end of the British Army's "honeymoon" period with nationalists in Belfast. For the following three decades, the British Army maintained a substantial presence on the Falls Road, with a base on top of the Divis Tower. This was removed in August 2005 as part of the British government's normalisation programme, following the Provisional Irish Republican Army's statement that it was ending its armed activities. In the intervening period, the Falls Road area saw some of the worst violence of "the Troubles". The last British soldier to be killed on the road itself was Private Nicholas Peacock, killed by a booby trap bomb left outside the Rock Bar, opposite the top of the Donegall Road. In 1991 IRA hit squads based in the Upper Falls and Beechmount were involved in attacks against loyalist paramiliaries in the nearby Village area. In September 1991, they shot dead 19-year-old UVF member John Hanna at his home on the Donegall Road, and in November the same year, they shot dead William Kingsberry and his stepson, Samuel Mehaffey, members of the UDA and RHC respectively, in their home on Lecale Street. The Falls district is now one of seven wards within the Black Mountain (District Electoral Area) which elects seven councillors to Belfast City Council. In 2014, five Sinn Féin, one SDLP and one People Before Profit councillors were elected. The Falls Road forms the centre of the Belfast West (UK Parliament constituency). The Westminster seat has been held by various nationalist politicians since the 1960s. Paul Maskey of Sinn Féin was elected MP in 2011, but in line with Sinn Féin's abstentionist policy he has not actually taken the seat at Westminster. In the 2017 Northern Ireland Assembly elections a total of four Sinn Féin and the same People Before Profit representative (Gerry Carroll) were elected in the Assembly constituency. Since the 1960s there has been a substantial revival of traditional culture in terms of Irish language, dancing and music. These are all showcased during the Féile an Phobail, an annual festival of Irish culture. Over the past generation there has been a revival of interest in Irish language in the area. This was initiated by the development by a small group of families of the Shaw's Road Gaeltacht in Andersonstown in 1969. Since then interest has grown, with the approval by Belfast City Council of a Gaeltacht Quarter around the Falls Road in 2002. Cultúrlann McAdam Ó Fiaich, known colloquially as the Cultúrlann, is an Irish language and arts centre based in the middle Falls area. The centre also houses Irish language bookshop An Ceathrú Póilí. One of three Carnegie libraries built in Belfast is situated on Falls Road. 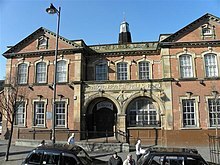 It opened on 1 January 1908 and is the last Carnegie library in Belfast still functioning as a library. There are number of educational institutions in the immediate area. In the Lower Falls district there are two primary schools. These are St. Peter's on Ross Road and St. Joseph's on Slate Street. In addition, there is the Irish language Gaelscoil an Lonnáin in the Lower Falls. Several older schools closed in the late twentieth century due to declining student numbers. These include St Finian's and St Gall's primary schools which were run by the De La Salle Christian Brothers. St. Catherine's Primary School which was run by the Dominican nuns closed in 2005. In the middle Falls district is located St. Paul's Primary School and Gaelscoil na bhFal. In the Upper Falls is located St. Kevin's Primary School. At the senior level there are three schools for girls. These are St Dominic's Grammar School for Girls, St Rose's High School, and St. Louise's Comprehensive College, which is one of the largest comprehensive girls schools in Europe. Senior schools for boys include St. Mary's Christian Brothers' Grammar School. This school was originally located in Barrack Street off Divis Street in the lower Falls Road area but transferred to a greenfield site on the Glen Road in the upper Falls area in the 1960s. There is also an Irish language secondary school Coláiste Feirste. At the higher education level there is St Mary's University College which is part of Queen's University Belfast. The Dunlewey Centre is a community education centre in the heart of the lower Falls Road. There used to be several Protestant churches located on or near the Falls Road but these have either been demolished or converted into other uses as their congregations dwindled. These churches included the Methodist church in Divis Street (1850-1966) which was designed by Charles Lanyon. There was also a Presbyterian church in Albert Street (1852-1972) where one of the ministers was the Rev. Henry Montgomery who helped establish the Shankill Road Mission in 1896, and the Broadway Presbyterian church in the mid-Falls area. That church has been converted into the Culturlann - an Irish language cultural centre. There are several large hospitals in the area including the Royal Victoria Hospital, the Royal Jubilee Maternity Service, the Royal Belfast Hospital for Sick Children (Children's Hospital), and the Royal Dental Hospital Opposite the Children's Hospital is Mulholland Terrace, a row of terraced houses which were built in the nineteenth century by David Mulholland. He also owned several bars in the area. ^ Language/Cultural Diversity – Irish Department of Culture, Arts and Leisure Archived 7 November 2012 at the Wayback Machine, dcalni.gov.uk; accessed 30 March 2015. ^ Belfast History, rushlightmagazine.com; accessed 30 March 2015. ^ "Old Pound Loney". Retrieved 9 December 2016. 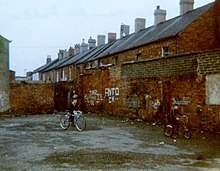 ^ Megan Deirdre Roy.Divis Flats: The Social and Political Implications of a Modern Housing Project in Belfast, Northern Ireland, 1968–1998[permanent dead link], uiowa.edu; accessed 30 March 2015. ^ Weiss, Ruth. Peace in Their Time: War and Peace in Ireland and Southern Africa. p. 34. ^ Purdie, Bob. Politics in the Streets: the origins of the civil rights movement in Northern Ireland, The Blackstaff Press; ISBN 0-85640-437-3. ^ bbc.co.uk; accessed 31 March 2015. ^ cain.ulst.ac.uk; accessed 31 March 2015. ^ Ed Moloney. A Secret History of the IRA; ISBN 0-14-101041-X, p. 91. ^ "Feile Belfast". Retrieved 9 December 2016. ^ "Independent Bookshops: A UK Guide — Independent bookshops in Northern Ireland". 1 October 2011. Retrieved 30 May 2017 – via The Guardian. ^ "Catalogue of the Photographic Exhibition of Irish Carnegie Libraries" (PDF). An Chomhairle Leabharlanna (Library Council of Ireland). Archived from the original (PDF) on 26 July 2011. Retrieved 4 September 2012. ^ "St. Peter's Primary School, Belfast". Archived from the original on 12 March 2017. Retrieved 10 March 2017. ^ "St. Joseph's Primary School, Belfast". Retrieved 10 March 2017. ^ "St. Paul's Primary School, Belfast". Retrieved 10 March 2017. ^ "'She was the only man on the Falls Road'". Retrieved 12 November 2016. ^ "St. Mary's Christian Brothers Grammar School, Belfast". Retrieved 12 November 2016. ^ "Dunlewey Centre Belfast Belfast". Retrieved 6 November 2016. ^ "St. Peter's Cathedral". Retrieved 2 October 2016. ^ "Clonard Monastery". Retrieved 2 October 2016. ^ "St. John's Falls Road". Retrieved 9 December 2016. ^ "Falls Road Methodist Church". Retrieved 2 October 2016. ^ "Rev. Henry Montgomery". Retrieved 2 October 2016. ^ "Culturlann Belfast". Retrieved 2 October 2016. ^ "Dunville Park, Belfast". Retrieved 12 November 2016. ^ "Falls Park, Belfast". Retrieved 12 November 2016. ^ "Belfast City Cemetery". Retrieved 12 November 2016. ^ "Royal Victoria Hospital, Belfast". Retrieved 12 November 2016. ^ "ancestry,co Mulholland". Retrieved 28 March 2019. ^ "Conway Mill". Retrieved 6 November 2016. Wikimedia Commons has media related to Falls Road.